Th anks for stopping by. If you’ve been on a tour of mine and have a few minutes of time consider rating my tour on Trip Advisor. As a freelance tour guide I work independently offering various tours of the city and also with Sandeman’s New Europe; so if you want/can you can also rate my tour on their Trip Advisor. AmsDARdam’s owner, Kendra Borgen, has been giving tours of the city since 2009. She specializes in history tours of the city which concentrate on the 800 years that would change this swampland into one of Europe’s early super-powers and beyond. We’ll look at the humble beginnings of this city and ‘old Amsterdam’ and take a voyage with the VOC through Amsterdam’s Golden Ages. 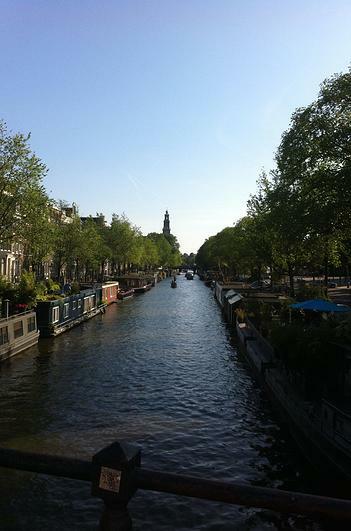 We’ll explore the cities hidden gems and stroll through some of the more than 100km (60miles) of Amsterdam’s canals. And of course we’ll look at one of the most famous Amsterdamers, Anne Frank. If history is not your thing there are also specialized tours that cover food culter and of course the more alternative side to Amsterdam; CoffeeShops, The infamous Red Light district and the history following the second world war into modern Amsterdam you think of today. I love giving Bike tours and they are a way to truly understand the madness of the city and love the Dutch have for their bikes. Feel free to ask if you’d like anything specific on your tour! In the blog you’ll find info on some of my dos and don’t in the city as well as all my favorite places, not to mention tips for surviving this wonderfully complicated city. If I’ve not written about something that you’ve visited and think belongs here, drop me a line and I’ll check it out too! AmsDARdam is available for private tours or you can join in on an open scheduled tour with Sandeman’s NewAmsterdam. Contact me for when I’m giving a tour and how to join.